This is the third year that Emory University Hospital Midtown has won a supply chain excellence award. Emory University Hospital Midtown has been awarded the 2018 Supply Chain Performance Excellence Award from Vizient, the largest member-driven health care performance improvement company in the U.S. The hospital was selected as the top-ranked performer out of a group of five Vizient academic medical center members. This is the third year that Emory University Hospital Midtown has won a supply chain excellence award. 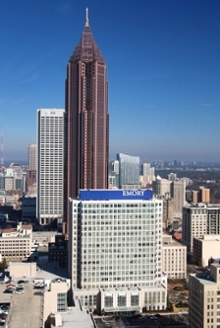 The award honors Emory University Hospital Midtown as the top-ranked performer in supply chain management as measured by supply expense at the facility level, as well as supply expense management within select departments including: laboratory, imaging, radiology, blood services, cardiology and surgical services. A supply chain is defined a system of organizations, people, activities, information and resources involved in moving a product or service from supplier to customer, while managing costs during that process. “We are proud of our exceptional team of staff contractors who work closely with our doctors, nurses and other clinical staff members to evaluate the medical supplies we need and negotiate pricing and contracts with medical vendors,” says Lee Partridge, director of Materials Management at Emory University Hospital Midtown.